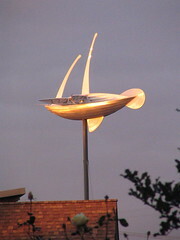 Miles Pepper's "Dream Ship" sails above the Beacon Hill library at sunset. Photo by Wendi. The Friends of Seattle Public Library Blog reports good news: yesterday, the City Council voted unanimously to increase support for library services by $860,000 in 2010, which will allow the restoration of some library operating hours and staff positions that would otherwise have been eliminated. Ballard, Broadview, Capitol Hill, Douglass-Truth, Greenwood, Lake City, Northeast, Rainier Beach, Southwest and West Seattle will also keep these hours. 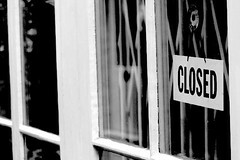 Unfortunately, not all eliminated hours can be restored, and while Beacon Hill’s library hours have been saved, some other neighborhoods will still have the pain of serious cutbacks. The following branches will be reduced to a five days/35 hours per week schedule: Columbia, Delridge, Fremont, Green Lake, High Point, International District/Chinatown, Madrona-Sally Goldmark, Magnolia, Montlake, NewHolly, Northgate, Queen Anne, South Park, University and Wallingford. 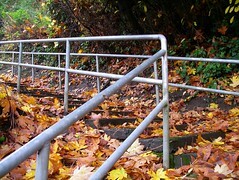 Autumn leaves on a Beacon Hill staircase. Photo by Matthew Rutledge -- thanks! The Beacon Hill Blog is now on Facebook!